The Classic 350 and Bullet series came with a front disc brake only until now. Royal Enfield has recently launched the rear disc brake across all variants. Hat tip to Youtuber Abinash Panigrahi for sharing this exclusive video. Royal Enfield has launched the Bullet 350 rear disc brake variant in India. Priced at Rs 1.26 lakhs – ex-showroom, its on-road price goes up to Rs 1.52 lakhs. The rear disc brake variant was spotted by Youtuber Abinash Panigrahi at a company dealership in Nashik. On-board features remain the same as those seen on the regular Bullet 350 with drum rear brake; except for the inclusion of a new rear disc brake and revised swingarm. This swingarm is of the same design as seen on the Bullet 350 which is exported to global markets. 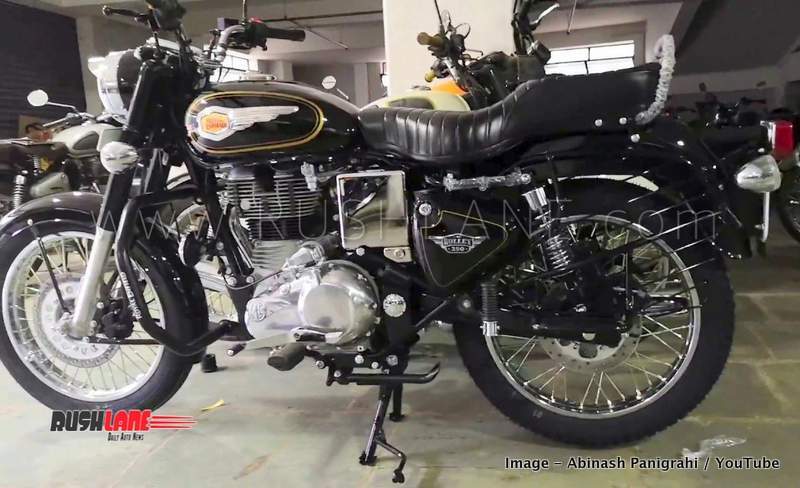 Royal Enfield Bullet 350 is offered in two variants – STD and Electric Start. The Standard variant is offered in a single shade of black with gold pinstripes while the Electric Start variant gets three color options of black, red and silver. Features on board the RE Bullet 350 include a single seat setup, chrome accents on fenders while it rides on 19” wire spoke wheels in the front and back fitted with tube type CEAT tyres. Fuel tank capacity is at 13.5 liters delivering riding range of around 450 kms on a full tank, while kerb weight is at 183 kgs. Suspension duties are carried out via telescopic forks at the front and twin gas charged spring loaded shock absorbers at the rear. Braking is via 280 mm front and 240 mm rear disc brakes while ABS is not offered, even as an option. ABS is expected to be added soon, prior to April 2019 when all two wheelers above 125cc should be equipped with ABS. Engine specifications on the Royal Enfield Bullet 350 is a 346cc, single cylinder, air cooled engine offering 19.8 bhp power at 5,250 rpm and 28 Nm torque at 4,000 rpm mated to a 5 speed gearbox.